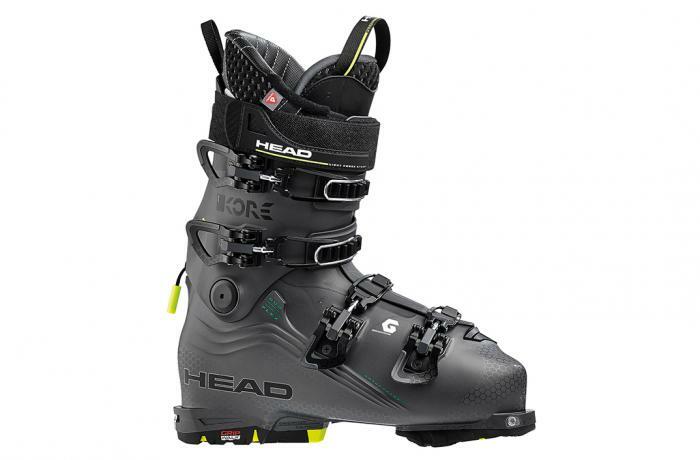 The 2018/2019 Head Kore 1 G was tested in the men's On-Off Area medium width category at Silver Mountain Resort by the experts at America's Best Bootfitters, powered by Masterfit. Head's first true foray into lightweight Freeride boots in the Kore 1 G was met with broad tester approval. They liked the fact that the light weight of the Grilflex and Graphene shell and cuff didn't reduce the kind of "real boot" fit or performance they've come to expect from Head. They liked that the simplicity and tradition of the Head four-buckle overlap has been modernized with space age plastics, tech binding compatibility and an intuitive, functional hike mode. Testers found the fit evenly snug and well adapted to bony points and wide spots, but they said it ran on the narrow end of the medium-width fit spectrum. That was not a criticism, but an observation—testers had zero complaints of hot spots or other fit issues. Testers that underwent the Liquid Fit liner injection process reported an improved rearfoot (heel and ankle) fit that they were able to control during the process, which they liked for its simplicity and immediately perceptible result. The Kore 1 G displayed accurate steering and a quick move to the edge (a perfect score there) then easily found a stable sweet spot through a variety of snow conditions during our test period, testers reported. Some testers thought the boot felt a little edgy at first but discovered that Form Fit shell molding created a more balanced and neutral feeling position. All testers who got Liquid Fit injected noted an uptick in steering, quickness and edging performance. The Smart Frame shell construction maintains thicker, ribbed and rigid Grilflex plastic in areas where stability and power are critical and keeps the thinner, better wrapping Grilflex where it suits foot-shape matching and easing entry and exit. Graphene is a powder additive to the plastic that increases stability and provide a damp feel like polyurethane without adding substantial weight. GripWalk soles come mounted on the Kore. Grilflex with Graphene/Grilflex with Graphene/n.a.